Thank you to everyone who entered our Olympic Sweepstake. I hope you all managed to watch some of the amazing badminton that has been played over the past couple of weeks. 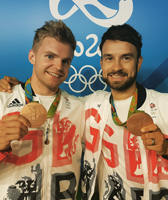 In particular, hopefully you managed to catch Team GB's Bronze Medal win in the Mens Doubles by Chris Langridge and Marcus Ellis! He has won a 1 hour coaching session. He has won a racket. Fu Haifeng and Zhang Nan from China. He has won a restring and accessories. Jung Kyung Eun and Shin Seung Chan from Korea. He has won a Team GB T-Shirt. Tontowi Ahmad and Liliyana Natsir from Indonesia. He has won a Yonex Racket Bag.